This is the second short story in Katey Lovell’s new Meet Cute series. I loved the first one because I can’t resist books or stories about bookshops (my review for that one is here). This second book was irresistible to me because it’s about two people who meet online. I met my husband on twitter many years ago so stories about couples who met online always interest me. This story is a little different from the first one in that the majority of the story is about the two characters getting to know each other online, but it always feels absolutely believable that Lauren was beginning to fall for this boy through emails. I could feel the butterflies that Lauren had in the build up to her meeting Toby; she had already developed feelings for him and so badly wants to feel the same way when he’s standing in front of her, to find out if the chemistry they’ve felt through emails is there in real life. For me, this story had more depth to it than the first one because there is naturally more back story with them communicating online from the start. The actual meet up is gorgeous. I reckon a few years from now these two could well be happily married and planning their whole lives together! The amount of detail Katey packs into these short stories is incredible, she is such a talented writer. I’m not the biggest fan of short stories but these stories have me hooked, I found myself completely absorbed in this one. They are so succinctly written, it feels like it surely must have been longer than it was because it’s such a complete story – it has everything you could want in a meet cute! I was very pleasantly surprised at just how different this story is to the first one, I did wonder if a series of very short stories all with the same theme of a meet cute might seem a little formulaic but I could not have been more wrong. Katey’s writing style is recognisable but beyond that this story is completely different. I can’t wait for the next one now! This story cannot fail to make you feel smiley; it’s impossible for it not to give you a mood boost too so it’s perfect for a coffee break when you might want a little escape to a different place for ten minutes. I highly recommend this story, it’s fabulous! I rate it 10 out of 10. 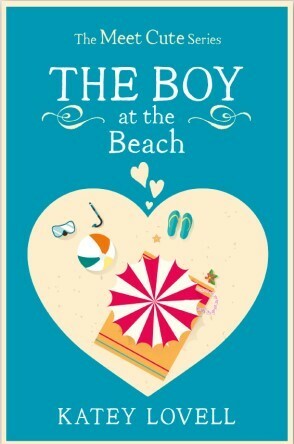 The Boy at the Beach is available now on Amazon. The third story in this series, The Boy at the Bakery is available for pre-order on Amazon and is due to be published on 12th November. Here are my reviews of The Boy in the Bookshop and The Boy Under the Mistletoe, two of the other short stories in this fab series. This entry was posted in Books, ebooks, Read 2015, Review and tagged Book Review, Books, Chick Lit, ebooks, Fiction, Katey Lovell, Read 2015, Review. Bookmark the permalink.